Stand up against the sun without sacrificing your skin. By using mineral powder sunscreen from Colorescience, you receive all the benefits of SPF—minus the harmful effects of harsh chemicals. Our mineral powders are naturally tinted to provide you with sheer coverage, while preserving and protecting your radiant complexion. Mineral sunscreen powder is sometimes called physical sunscreen because it sits on top of the skin to physically filter UVA and UVB light. Most often, the active ingredients in mineral sunscreen are zinc oxide and titanium dioxide, which have natural light-reflecting properties. Whereas chemical sunscreens work by absorbing UV rays and converting them into heat, all natural mineral sunscreen acts like a mirror and refracts these harmful rays. Our mineral sunscreen SPF 30 offers as much protection as its chemical counterpart, but contains no adverse health effects. Why is mineral sunscreen better? Many people are unaware of the toxic chemicals found in traditional sunscreen formulas. Ingredients such as oxybenzone found in most conventional chemical sunscreens have shown to absorb into the skin. Once these foreign compounds enter the bloodstream, they unleash a variety of consequences, including disruptions to the endocrine system and hormonal regulation. Mineral powder is the surest way to apply sunscreen chemical free. Choose an organic sunscreen SPF 30 or healthy sunscreen SPF 50 for all-natural sun protection that won’t clog pores or cause cellular damage. For more information about why you should choose mineral sunsreen over chemical, read our mineral vs chemical sunscreen page. How do I apply mineral powder sunscreen? Some fear mineral sunscreen is messier than chemical lotions, but Colorescience alleviates this concern with our easy self-dispensing applicator. 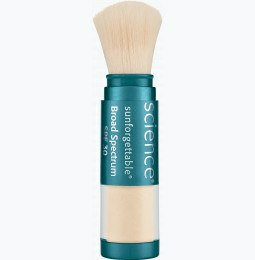 Simply move the applicator in circular motions to release the powder for effortless brush-on sunscreen throughout the day. You’ll save yourself from greasy, oily hands while also avoiding toxic ingredients. Remember to apply your sunscreen liberally 30 minutes prior to sun exposure to activate the product’s full potential.